They had to chase the target in 18.4 overs to qualify. Jones Tuti Patriots failed to qualify for the Playoffs for the first time in the TNPL despite beating iDream Karaikudi Kaalai by four wickets for their fourth win in the 2018 Sankar Cement-sponsored third edition at the ICL Sankar Nagar ground in Tirunelveli on Sunday, Aug 5. 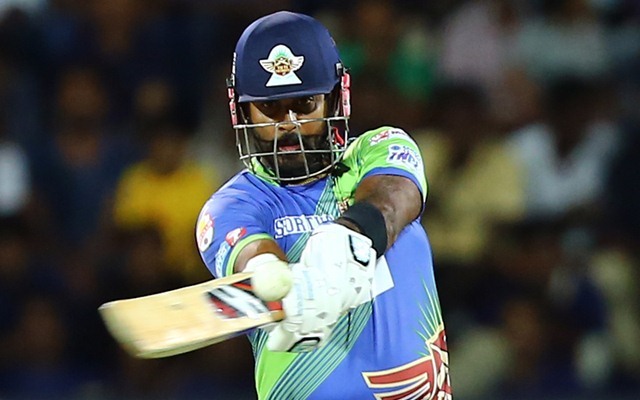 Patriots required to achieve the target of 165 runs inside 18.4 overs to take the fourth spot in the Playoffs ahead of Lyca Kovai Kings. They won with four balls remaining but that wasn’t sufficient. Karaikudi Kaalai complete the Playoff line-up along with Lyca Kovai Kings, Siechem Madurai Panthers and Dindigul Dragons. Patriots raced to 45 without loss in the first four overs with Kaushik Gandhi 21 and S Dinesh 23 firing. Kaalai off-spinner S Swaminathan removed both the openers in the fifth over to peg back Patriots. S Anand reconstructed the innings with a 32 but was fell at a crucial juncture. R Sathish hit 57 (34b,6×4,2×6) to take the team home but not to the Playoffs. Put in, Karaikudi Kaalai began well with the openers S Anirudha (28) and V Aaditya (37) stitching their fourth 50-plus partnership of the season. However, the side collapsed to 77/3. R Srinivasan hit an unbeaten 46 to lift the total to 164/6. Athisayaraj Davidson picked up two late wickets while conceding 35 runs. iDream Karaikudi Kaalai 164/6 in 20 overs (R Srinivasan n.o. 45, V Aaditya 37, S Anirudha 28, A Davidson 2-35) lost to Jones Tuti Patriots 165/6 in 19.2 overs (R Sathish n.o. 57, Anand S 32, S Swaminathan 3-22).